Fish breath. Not exactly a pleasant thought, is it? And I'm not gonna lie to you, after eating this, most likely only your mother will want to kiss you. On second thoughts, maybe not even your mother. Unless you employ some serious bribe action. Note how I've even excluded TheHusband in this category. Fish breath is serious business people. Also, the frying bokkoms* will make your entire kitchen smell like a fish factory for about a day or so. Unless you follow the advice of fellow SA Blogger CollyWolly. Even our cats seemed less than impressed. I kid you not - the smell is strong. No make that Strong. With a capital "s". 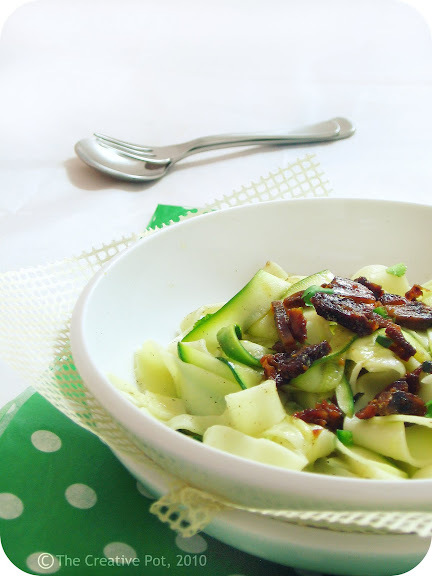 Think crispy crunchy anchovy-like morsels tossed with slippery ribbons of tagliatelle and zucchini and dressed to perfection with lashings of olive oil and lemon juice. Interested yet? Bokkoms* really are no different (in taste at least) to anchovies. Salty and intense and yes super fishy, but the flavour is unmatched. And afterall, you're only using a wee bit at a time, so really there's nothing to be afraid of. Still don't believe me? Well, this dish is a close approximation of my first encounter with the fear-inducing bokkoms* and I was instantly smitten. Ready to take the plunge then? * For my overseas readers unfamiliar with the term, bokkoms are a distant cousin to that famous South African delicacy, biltong. Which, as you know is dried, cured meat. Bokkoms apply the same idea to fish, using whole mullets, found in abundance along the West Coast of South Africa. They are are heavily salted and carry a notoriously fishy odour. 1. Bring a large pot of salted boiling water to the boil, then add pasta and a generous pinch of salt. Cook until al dente. 2. Meanwhile, heat 2 tsp olive oil in a small frying pan. Flash fry the garlic and chilli, then add the bokkoms, frying for another few minutes or until crispy. 3. 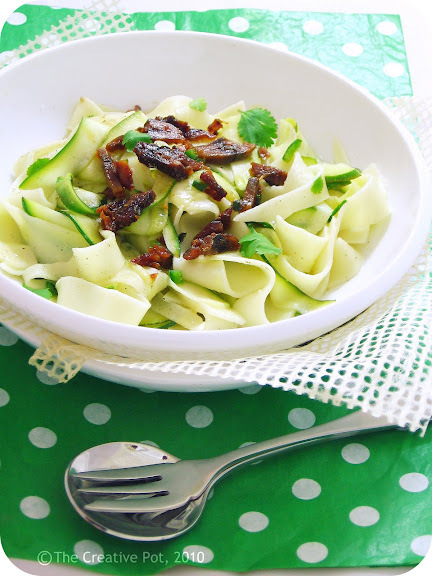 Start making thin zucchini ribbons and halve each ribbon lengthwise. By this time, the tagliatelle will almost be done, so add the zucchini to the pot to cook for the last minute or so. Zucchini should not be mushy, just between crunchy and soft. 4. Drain pasta and zucchini and toss with bokkoms. Drizzle with olive oil and lemon juice and season to taste with salt (but this probably won't be necessary as the bokkoms are quite salty on their own). Crumble feta over, if using, and serve immediately. For my fellow South Africans: Bokkoms are available freely in delis and roadside stalls along the West Coast. Select delis/specialist stores elsewhere will also stock it, but it's pretty difficult to track down. In my hometown of Stellenbosch, I know Oom Samie's stocks it (vacuumpacked = WIN). Hey Marisa, this is a thing of beauty!! My history with bokkoms goes back a long way. My father sed to place them om the braai for a few seconds, then the skins come lose and while telling us stories, he would cut strips with his pocket knife and share them with us kids.Thx for this trip down memory lane!! I think I would prefer the fresh mullet than the bokkoms, but one day will give it a try! Nina - Ah what a cool story! I should try them on the braai in summer, sounds like a nice twist. Tandy - You have to try it some day! It really is not nearly as scary as one thinks. Nate - How interesting! Thanks for the link, will check it out. Sweet Artichoke - Wonder what type of fish that was? Looks like ours is not the only cuisine that it is used in. Very interesting! Raw zucchini is delicious - would work very well raw in the pasta as well. This dish looks absolutely incredible in every way! As I was born up the west coast, I grew up with bokkoms - we even carried our own little pen knives to peel and clean them! Will definitely try the recipe - when husband is in Jhb!! The Teenagers can use clothes pegs - payback for stink socks and gym clothes. I allways used to keep a bunch of bokkoms hanging in the garage, but I am glad that they come vacuumpacked and cleaned now! Some of the best things in life don't smell too good! Hah! Such as certain oozy cheeses, kimchi, lots of Chinese preserved veggies -- you name it. But boy, do they add magical complexity to everything they touch. Not very tempted here - even though I live within striking distance of West Coast bokkom stamping grounds! I'm only just coming to terms with anchovies....! Bokkoms? No idea what that is. This is so springy! Love the way you presented it. My first encounter with the name bokkoms. But tell you what this dish you cooked up looks really superb. I would like to try bokkoms one day. Carolyn - Just like you said! Never thought of it that way, but so true. Joanne - It does look springy, doesn't it? Can't believe winter is almost over. I am yet to try bokkoms, I think I fear the smell more than anything else. I will say, besides all the warnings I am very tempted - just have to cook it in someone else's kitchen!